I am a huge fan of anything that is made from olives, capers and anchovies! I simply love anything salty and thought that this recipe combined with the crisp sweetness of the cucumber and the buttery goodness of the Ritz crackers would be divine! I was right!!! It was a wonderful way to use up some of the cucumbers from my garden in a new way. First, prepare the tapenade. Puree the olives, garlic, anchovy and capers in a food processor until you have a smooth paste of an unappetizing colour. Add the olive oil, continue processing for a short while, and the tapenade is ready. Cut off one end of the cucumber and remove the seeds using a narrow knife. Fill the hollowed cucumber with tapenade. Press a cracker against the cucumber end, cut off a slice of the cucumber and catch the slice on the cracker. 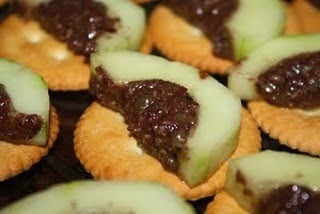 Repeat the procedure until you have enough crackers, each covered with a tapenade-filled cucumber slice. Any tapenade that is left will keep for at least a week in the fridge and can be used as a spread.